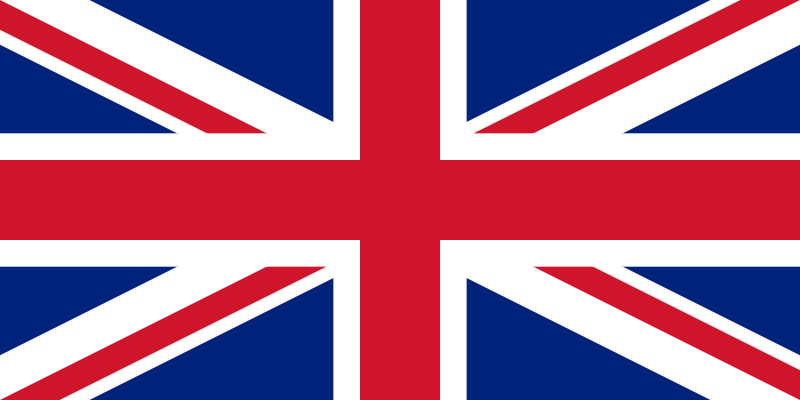 Greetings from Merry Old England! Jonathan Dean here, Seattle Opera’s Director of Public Programs and Media, on location in this scepter’d isle where I’ve been traveling recently. I got to hear two fascinating operas, and wanted to make you a report. Last week I had the privilege of being at the world premiere of Two Boys, a new opera by the young American composer Nico Muhly, with libretto by the well-known American playwright and screenwriter Craig Lucas. The opera was commissioned by ENO, the English National Opera, along with the Metropolitan Opera and Lincoln Center Theater. The premiere was in London at the Coliseum, the home of ENO; Bart Sher, who has collaborated many times with Lucas, directed the production. If you pay close attention to the world of opera online, you’ll have seen the brilliant little film that ENO put together promoting Two Boys, which rapidly scored a million views on YouTube. 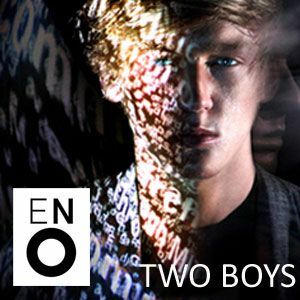 The opera, which is about the allure and danger of online relationships, draws its story from something that really happened a couple of years ago in the north of England: two boys (one 13 and one 16) connect online and meet in a garbage-collection area behind a shopping mall. Footage from the security camera shows them meeting and going into a dark corridor; then, a minute or so later, the older boy emerges, in distress--and the younger boy is found shortly thereafter, in a pool of blood in the corridor, stabbed. What happened? The opera’s protagonist is the detective who has to untangle the case; it’s the first opera I can remember hearing that was basically a crime-thriller mystery. At the end, the detective (and the audience) figures out exactly what happened, and why, and since it’s coming to New York I better not spoil anything. All I’ll say is that I was at the edge of my seat all the way through a full-length, two act opera; I connected with several great, sharply-drawn characters, including the two boys and their parents and most of all the frazzled detective and her mother; and that I found Muhly’s music extremely appealing. The opera features several duets taking place in chat rooms, and a couple of general, internet-wide choruses, which Sher has staged with each member of the chorus illuminated by the screen of the laptop he or she is holding. The chorus of the bullying voices of online teenagers was particularly chilling. I followed Two Boys’ operatic vision of a cheerless, disconnected modern world with a much sunnier opera: Wagner’s Die Meistersinger von Nürnberg, which Seattle Opera will present in the summer of 2014. Meistersinger is rapidly becoming my favorite opera; last summer I got to hear it when I wrote titles for Cincinnati Opera’s production. This summer, Glyndebourne Festival Opera did it for the first time. 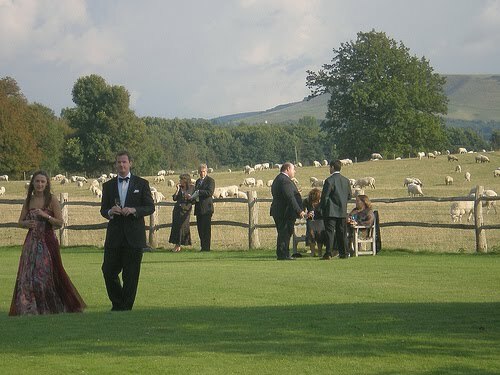 One of my favorite opera companies in the world, Glyndebourne presents six superlative opera productions every summer in a small, lovely theater in a rural area in East Sussex. Meistersinger is only their second Wagner; they did a very successful Tristan und Isolde a few years ago, and then revived it. And Meistersinger is no small undertaking--it doesn’t get produced very often because it’s Wagner’s biggest opera, in size and scale: it requires an enormous chorus (Glyndebourne had about 100), eight major singers plus ten other named roles (the crowd of “Mastersingers” who give the opera its title), movement artists, a huge Wagner-sized orchestra, and like all the great Wagner operas it is extremely long. At Glyndebourne, where opera-goers take a meal during an extended intermission--you should see us out there, picnicking on the lawns in our tuxes and gowns, with sheep just the other side of the “ha-ha”--the show began about 2 and wrapped up about 9. It went by in a flash, as a good Wagner production should do; not a bad way to spend a day. 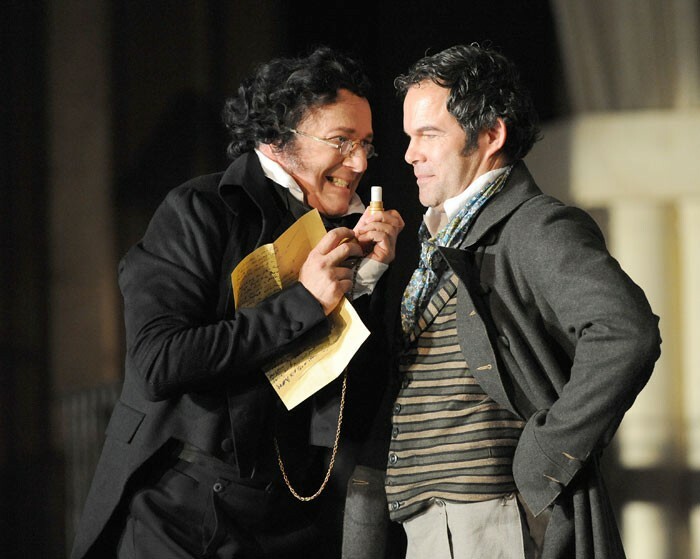 Gerald Finley, the great Canadian bass-baritone, was singing the central role of Hans Sachs for the first time in his career. Although he hasn’t been associated with Wagner before now, he poured himself body and soul into an amazing performance, and it was a privilege to be there to hear it. (I was at the final performance; they simulcast it to movie theaters, including an Imax Theater at London’s Science Museum, and plan to release a DVD.) The production, by David McVicar, will appear next at Lyric Opera of Chicago, who co-produced it with Glyndebourne. It’s an extremely handsome production, set in 1813, the year of Wagner’s birth; since Meistersinger is a romantic comedy set in a small provincial town where people are basically good, if a bit full of themselves, the world of the production reminded me of Jane Austen’s novels. Johannes Martin Kränzle as Beckmesser and Gerald Finley as Hans Sachs. I was a bit surprised, and moved, by how REAL McVicar and his cast made all the characters. Meistersinger, Wagner’s only comedy, is a bit like Barber of Seville--it’s so funny, and cheery, that sometimes in performance the comedy tends to get a little broad, the characters become more like cartoons or caricatures than like real people. Certainly that’s easy to do with Wagner’s ridiculous Mastersingers, who are this volunteer guild of self-important small-town ‘singing-artist-poets,’ each of them with day jobs, who feel responsible for upholding the tradition of great German art. And the two lead Mastersingers, Hans Sachs and Sixtus Beckmesser, hero and villain of the piece, have become iconic opera characters--ones like Carmen, or Don Giovanni, or Méphistophélès, where it’s very hard for a performer to cut through the image the audience already has of the character, make you suspend your disbelief, and grant that, for this night only, this singer is that character. But Finley and Johannes Martin Kränzle, the Beckmesser, presented these two characters in a way I’d never seen or thought of them before: as perfectly valid suitors for the heroine’s hand. In the opera’s first scene we learn that Eva, the heroine, is in love with the handsome young knight Walther von Stolzing; but for most of the opera, everybody believes she’ll marry either Sachs or Beckmesser. When they are both attractive options, as well as Walther, the drama becomes much richer--the way Barber of Seville becomes more interesting if Bartolo has a few redeeming features, or maybe we see that there’s a non-Prince Charming side to Almaviva. 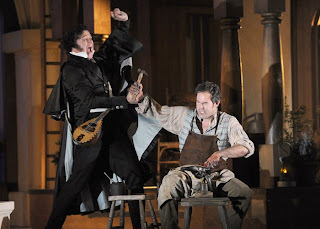 In any event, I adore Die Meistersinger, and am so glad we’re going to be doing it in Seattle. It’s an opera all about utopias. The only Wagner opera set on planet earth as it is (i.e. no magic gold, doomed mariners, evil witches and wizards, dragons, underground love-grottoes filled with cavorting ancient Greek deities, etc. ), it’s also the only opera in which Wagner presented a vision of his ideal world: an intimate, low-tech place, somewhere everybody knows and takes care of each other, a world in which everyone takes art seriously and makes and enjoys art, even if they argue and disagree about it all the time. In other words, band camp. All of Wagner’s characters are projections of himself, but in Hans Sachs I think he gave us his utopian vision of himself, the best Richard Wagner he could possibly be. What is your utopia? And if you were to invent a fictional character, and project the very best of yourself onto her or him...what would that person be like? Terrific post -- I love the idea of "Meistersinger" as "band camp"! I'd say that's the basic idea of the Bayreuth Festival--let's all go out to a remote location, away from all distraction, and focus on making great music together. Hallo, Jon & SeaOp Blog-readers! Thanks folr a MOST interesting "Letter from England"!! also conducts it as if it were chamber music, also making it unpompus. There are no great voices, but much great comedy! Well-worth seeing if on when anyone is in Berlin!! But I also look forward to the SeaOp production in 2014!! Toi, toi, toi!! !